Ahh- an interesting ‘Protest’ant perspective, enjoy. It’s not often that I find such inspiration and insight in a Methodist “Reformation Sunday” homily. Would that every Protestant cleric might reflect on this….. as well as we Catholics. Stanley is one of the most prophetic f$%@*?g theologians on the planet. This sermon makes me glad that circumstances prevented my ordination on October 31, 1998 in favor of November 1 (All Saints’ Day). I must begin by telling you that I do not like to preach on Reformation Sunday. Actually I have to put it more strongly than that. I do not like Reformation Sunday, period. I do no understand why it is part of the church year. Reformation Sunday does not name a happy event for the Church Catholic; on the contrary, it names failure. Of course, the church rightly names failure, or at least horror, as part of our church year. We do, after all, go through crucifixion as part of Holy Week. Certainly if the Reformation is to be narrated rightly, it is to be narrated as part of those dark days. For example, note what the Reformation has done for our reading texts like that which we hear from Luke this morning. We Protestants automatically assume that the Pharisees are the Catholics. They are the self-righteous people who have made Christianity a form of legalistic religion, thereby destroying the free grace of the Gospel. We Protestants are the tax collectors, knowing that we are sinners and that our lives depend upon God’s free grace. And therefore we are better than the Catholics because we know they are sinners. What an odd irony that the Reformation made such readings possible. As Protestants we now take pride in the acknowledgement of our sinfulness in order to distinguish ourselves from Catholics who allegedly believe in works-righteousness. Unfortunately, the Catholics are right. Christian salvation consists in works. To be saved is to be made holy. To be saved requires our being made part of a people separated from the world so that we can be united in spite of–or perhaps better, because of–the world’s fragmentation and divisions. Unity, after all, is what God has given us through Christ’s death and resurrection. For in that death and resurrection we have been made part of God’s salvation for the world so that the world may know it has been freed from the powers that would compel us to kill one another in the name of false loyalties. All that is about the works necessary to save us. The magisterial office–we Protestants often forget–is not a matter of constraining or limiting diversity in the name of unity. The office of the Bishop of Rome is to ensure that when Christians move from Durham, North Carolina to Syracuse, New York, they have some confidence when they go to church that they will be worshipping the same God. Because Catholics have an office of unity, they do not need to restrain the gifts of the Spirit. As I oftentimes point out, it is extraordinary that Catholicism is able to keep the Irish and the Italians in the same church. What an achievement! Perhaps equally amazing is their ability to keep within the same church Jesuits, Dominicans, and Franciscans. I think Catholics are able to do that because they know that their unity does not depend opon everyone agreeing. Indeed, they can celebrate their disagreements because they understand that our unity is founded upon the cross and resurrection of Jesus of Nazareth that makes the Eucharist possible. They do not presume, therefore, that unity requires that we all read Scripture the same way. Therefore Catholics understand the church’s unity as grounded in reality more determinative than our good feelings for one another. The office of Rome matters. For at least that office is a judgement on the church for our disunity. Surely it is the clear indication of the sin of the Reformation that we Protestants have not been able to resist nationalistic identifications. So we become German Lutherans, American Lutherans, Norwegian Lutherans. You are Dutch Calvinist, American Presbyterians, Church of Scotland. I am an American Methodist, which has precious little to do with my sisters and brothers in English Methodism. And so we Protestant Christians go to war killing one another in the name of being American, German, Japanese, and so on. At least it becomes the sin of Rome when Italian Catholics think they can kill Irish Catholics in the name of being Italian. Such divisions distort the unity of the Gospel found in the Eucharist and, thus, become judgements against the church of Rome. Of course, the Papacy has often been unfaithful and corrupt, but at least Catholics preserved an office God can use to remind us that we have been and may yet prove unfaithful. In contrast, Protestants don’t even know we’re being judged for our disunity. You can tell the destructive character of that narrative by what it has done to the Jews. The way we Protestants read history, and in particular our Bible, has been nothing but disastrous for the Jews. For we turned the Jews into Catholics by suggesting that the Jews had sunk into legalistic and sacramental religion after the prophets and had therefore become moribund and dead. In order to make Jesus explicable (in order to make Jesus look like Luther – at least the Luther of our democratic projections), we had to make Judaism look like our characterization of Catholicism. Yet Jesus did not free us from Israel; rather, he engrafted us into the promise of Israel so that we might be a people called to the same holiness of the law. I realize that the suggestion that salvation is to be part of a holy people constitued by the law seems to deny the Reformation principle of justification by faith through grace. I do not believe that to be the case, particularly as Calvin understood that Reformation theme. After all, Calvin (and Luther) assumed that justification by faith through grace is a claim about God’s presence in Jesus of Nazareth. So justification by faith through grace is not some general truth about our need for acceptance; but rather justification by faith through grace is a claim about the salvation wrought by God through Jesus to make us a holy people capable of remembering that God’s salvation comes through the Jews. When the church loses that memory, we lose the source of our unity. For unity is finally a matter of memory, of how we tell the story of the Reformation. How can we tell this story of the church truthfully as Protestants and Catholics so that we might look forward to being in union with one another and thus share a common story of our mutual failure? We know, after all, that the prophecy of Joel has been fulfilled. The portents of heaven, the blood and fire, the darkness of the sun, the bloody moon have come to pass in the cross of our Savior Jesus Christ. Now all who call on that name will be saved. We believe that we who stand in the Reformation churches are survivors. But to survive we need to recover the unity that God has given us as survivors. So on this Reformation Sunday long for, pray for, our ability to remember the Reformation – not as a celebratory moment, not as a blow for freedom, but as the sin of the church. Pray for God to heal our disunity, not the disunity simply between Protestant and Catholic, but the disunity in our midst between classes, between races, between nations. Pray that on Reformation Sunday we may as tax collectors confess our sin and ask God to make us a new people joined together in one might prayer that the world may be saved from its divisions. Nice personal recount from Fr. G.
It is nice when someone sends you spam and it actually checks out. Instead of sending it to everyone. I will post it here for both people who read my blog to see! recognize Abbey in heaven. She told me what to write, and I did. would get to heaven, and I wasn't about to disillusion her. Your Pet Dies by Mr. Rogers (Fred Rogers). running and playing. Abbey loved being your dog, you know. angels is taking care of this for Me. I hope this little book will help. Thank you for your beautiful letter. Thank your mother for sending it. I have been following the issue of women priest since 1976. Yes, 31 years. I am 37, do the math. It was one of many factors that lead me to leave what was the Episcopal church. I recently received this article from one of my Priest friends. Newsweek article. He sent me this excellent response in reply. I guess the Pope is colorblind like me. 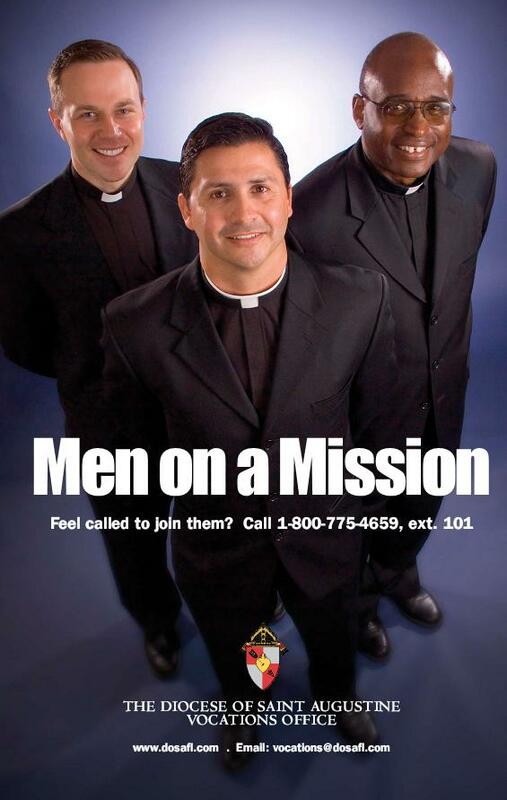 The Diocese of St. Augustine’s Vocation office has initiated a recruitment campaign. Here is the poster with Fr. Remek on the left and Fr. Boddie on the right! Episopal “Church” at it again. A Sunday school teacher decided to have her young class memorize one of the most quoted passages in the Bible; Psalm 23. She gave the youngsters a month to learn the verse. Little Rick was excited about the task — but, he just couldn’t remember the Psalm. After much practice, he could barely get past the first line. “Only the Ten Commandments,” answered the lady. “Energy efficient vehicle: Runs on oats and grass.